Canberrans know what a uniquely picturesque city we live in. Its mix of native and introduced flora, a diverse range of 20th century architectural styles and the stunning backdrop of the Brindabellas are a pleasure to the eye. Filmmakers have occasionally also recognised Canberra's beauty and used the city as a setting for movies and television productions. Over the years, Canberra has also been seen on screens large and small in establishing shots for political dramas and comedies, and even as a backdrop for a Bollywood dance number. It is not surprising then that a 1981 proposal to establish a $35 million film studio in Canberra temporarily dazzled the Minister for the Capital Territory and the Canberra Development Board (CDB), until the tax officials stepped in. Files on the application to construct a film studio in Canberra are ArchivesACT's Find of the Month. Since Canberra's early days, there have been several proposals by the Commonwealth Government to create a national film studio in the capital. In 1928, a Parliamentary Royal Commission on the Motion Picture Industry concluded that, "The proposal for a national studio at Canberra had proved impossible on account of transportation costs." 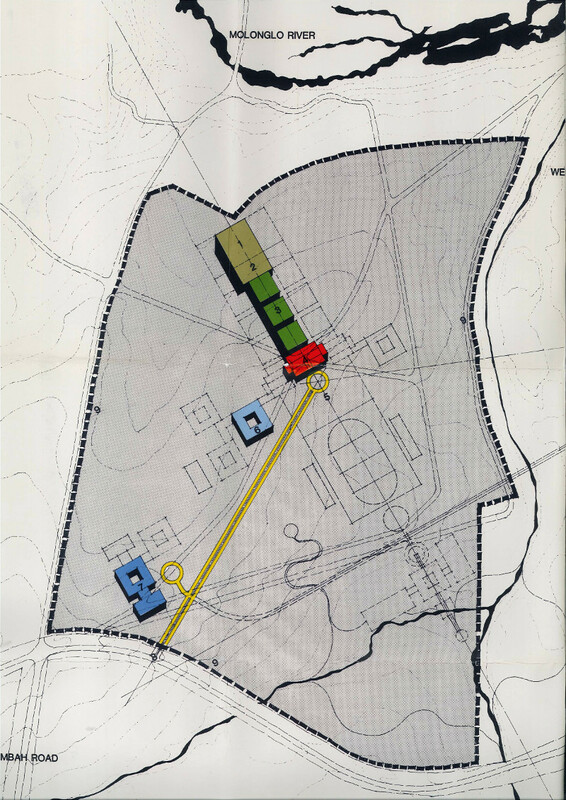 In 1945, a proposal by the Australian National Film Board (later to become Film Australia) to build studios in Canberra met with opposition due to competing construction priorities to address a housing shortage. Then-Minister for Information Arthur Caldwell had wanted Canberra to become "the focal point of the documentary film industry in Australia." 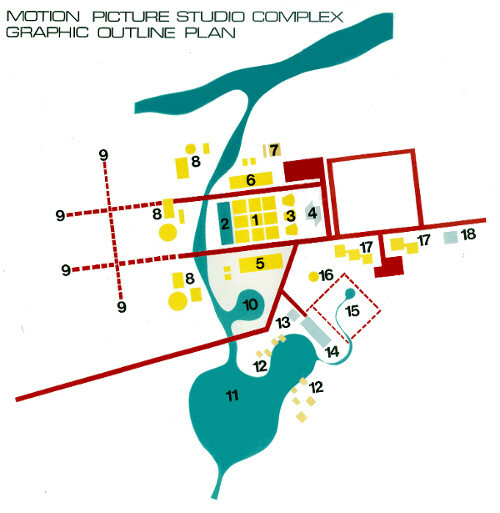 It was not until 1981 that a plan to build a film studio in Canberra looked like a real possibility. 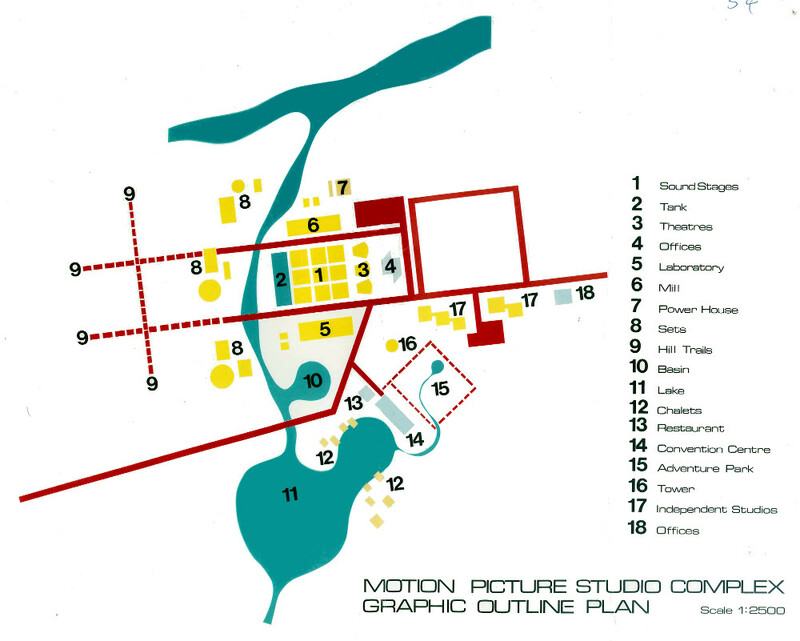 In October 1981, United American & Australasian Film Productions Pty Ltd (UAA) approached the Department of Capital Territory (DCT) proposing the development of a film studio complex in Canberra. 'Cable City Canberra' would be a minimum 25 hectare site comprising film studios, processing laboratories, screening rooms, set design and manufacture, canteens and possibly some accommodation. UAA considered Canberra over other Australian capital cities due to "the lack of air pollution, ease of movement, variety of landscapes and access to other scenery eg. coastal and mountainous areas." Despite its name, UAA was an Australian company founded in Perth, Western Australia in 1979. By the time of its studio proposal, UAA had invested in several movie and TV productions including Deathtrap and Arthur. The following month, representatives from the National Capital Development Commission (NCDC), the Canberra Development Board and the DCT escorted UAA Directors John Picton-Warlow and David Thomas to "several areas west of the City, including Pine Island." One of these sites was Weston Creek Block 649, the former Weston Creek sewerage works located off Cotter Road and opposite the suburb of Holder. Weston Creek North had been designated as a tourist area due to its "unique landscape character." The DCT already had an application to create a wildlife reserve on the sewerage works site, although it was believed this application would be withdrawn for the film studio proposal. Following the site tour, Picton-Warlow wrote to the Minister for the Capital Territory, Michael Hodgman, stating, "I confirm we were shown a site by your Miss Christine Purdon which includes the old sewerage works south of Canberra and this area definitely interests us." The NCDC reserved the site for 12 months while UAA completed a feasibility study. In February 1982, UAA announced that its preliminary investigations indicated the project was feasible and it was proceeding with commercial negotiations. The company would also commission an American expert in studio designs to come to Australia to assist in the preparation of a proposal. In April 1982, Hodgman wrote to UAA advising that he had authorised the DCT to enter into "firm negotiations" with a view to granting a 99-year lease to UAA. Later that month, UAA engaged the architectural firm Cameron Chisholm & Nichol, to produce studio design concepts. Founded in 1884 in Perth, Western Australia, Cameron Chisholm & Nichol (CCN) was already an established name in Canberra, having designed the Belconnen Mall and, most notably, the National Carillon. 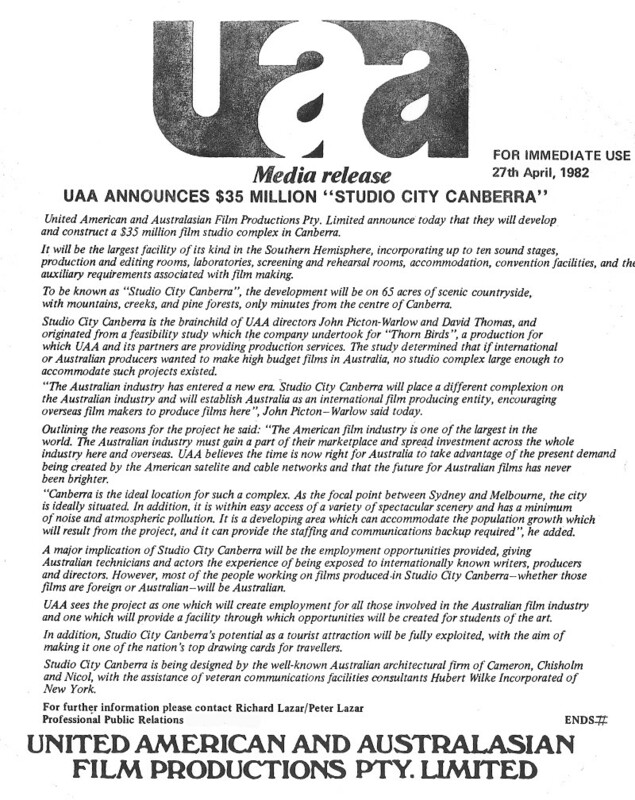 On the 27 April 1982, Hodgman and UAA officially announced a proposal for 'Studio City Canberra'. The Minister's press release stated the film studio project was "a dynamic breakthrough for Canberra", while UAA described the proposed facility as "comparable in size and quality to England's Pinewood Studios." All parties expected construction to begin within 12 months. In May 1982, the NCDC's Chief Planner, G.J. Campbell, informed the DCT of the significant cost of the decommissioning and remediation work required to make the former sewerage works site suitable for redevelopment. In July 1982, after an overseas study tour of film studio complexes, Ross Chisholm of CCN also believed that the proposed sewerage works site was unsuitable. He said the site was too hilly and that UAA should consider a flatter site. 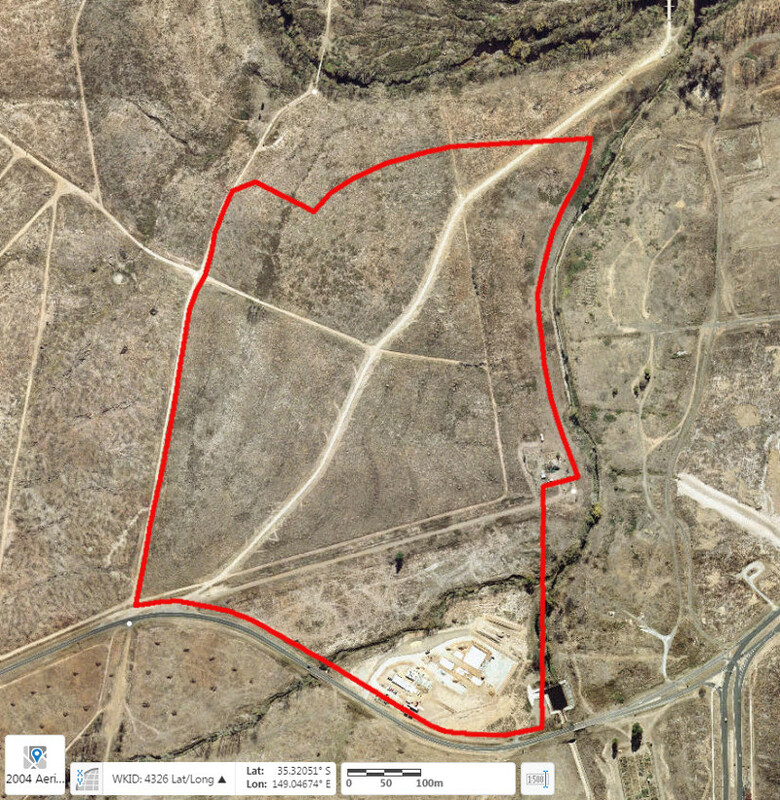 By August, the DCT and CCN agreed that the pine plantation area adjacent to the sewerage works, west of Weston Creek, was a more suitable location. At this time, another UAA director, G.A. Lloyd, detailed some of the studio's major features, including a 9290 square metre storage facility, a "first class manufacturing workshop" and the "best film laboratory in the southern hemisphere." Lloyd also added that he had had discussions with Professor Sam Richardson from the Canberra College of Advanced Education (CCAE) who "was very excited about the prospect of the company including a teaching facility in its development." 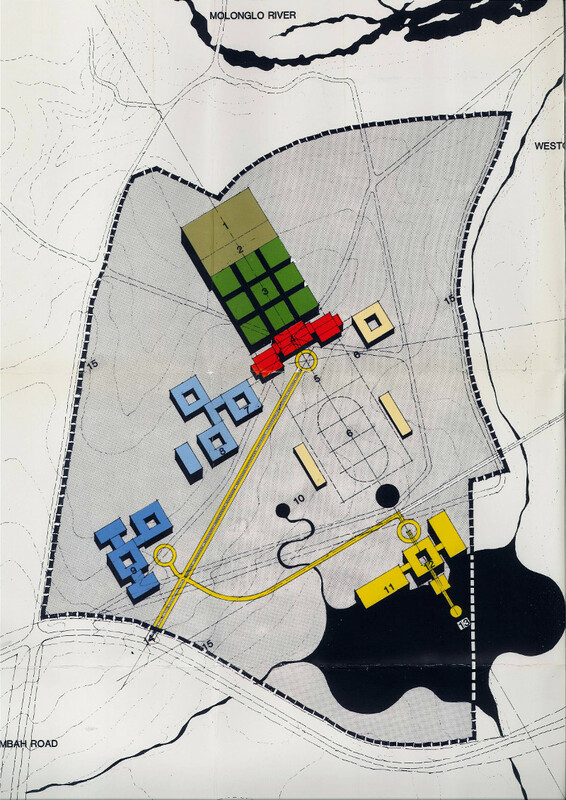 CCN submitted its first Conceptual Study for the new site in September 1982. The proposal was generally acceptable but the NCDC felt there was insufficient information in the study for a detailed appraisal or the lodgement of a Notice of Intention under the Environmental Impact Statement procedures, which would be required for any engineering design work to proceed. A second Conceptual Study in late September contained little additional information. This resulted in the NCDC sending letters to both CCN and CDB detailing the specific requirements for future submissions. CCN tabled its third and fourth design studies in 1982 and 1983, and UAA offered to lodge a bank guarantee to cover the cost of the engineering design (about $40,000) which was "to be paid to the Commission in the event of development not proceeding." The architects hoped that construction would commence in January 1984. 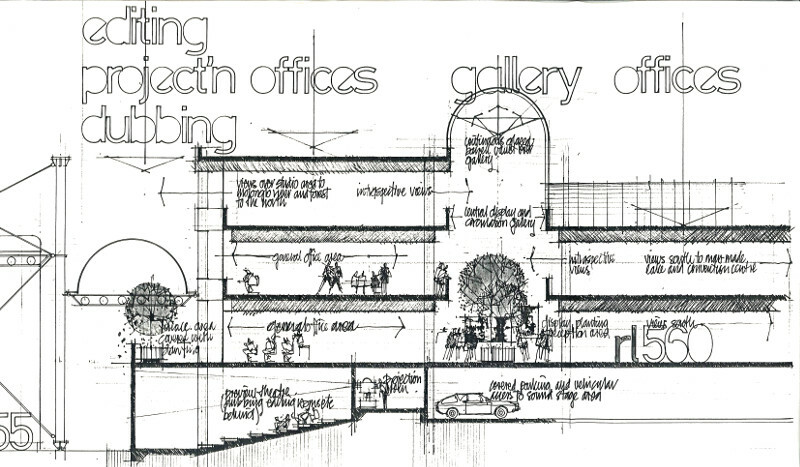 The first inkling that something might go wrong for the Studio City Canberra proposal arose soon after the official announcement of the project in April 1982. By that time the media was raising concerns over the use of film investment schemes to exploit Australian tax laws. Filmnews reported that several film production companies, including UAA, "have been set up to gain tax benefits for film investors through Section 51(1) of the Tax Act." Under this provision film industry investors could potentially receive a 375% tax write off on their first year's investments. While the aim was to stimulate investment in local film production, it inadvertently left open a loophole that ultimately created a negative effect on the Australian film industry. In August 1982, despite the debate over the tax loophole, both UAA and Minister Hodgman were confident that Studio City Canberra would proceed. Hodgman stressed, "that the modis operandi of the company - tax wise - was not his direct concern." He continued, "failure of the venture financially would be a regret to him but not a personal embarrassment." Treasurer John Howard stated in an October 1982 press release that the Commissioner of Taxation was examining the film investment loophole to determine "whether any amendments to the income tax law should be proposed." Howard also suggested to Hodgman around this time "that it would be unwise for the Commonwealth to negotiate further with UAA until the taxation issues are resolved." In December 1982, Howard closed the investment loophole. While UAA was adamant that this was not the end of Studio City Canberra, it believed that "It could delay us in getting public money for a while" although it had "$2 million set aside to proceed with the first stages [of the studio]." 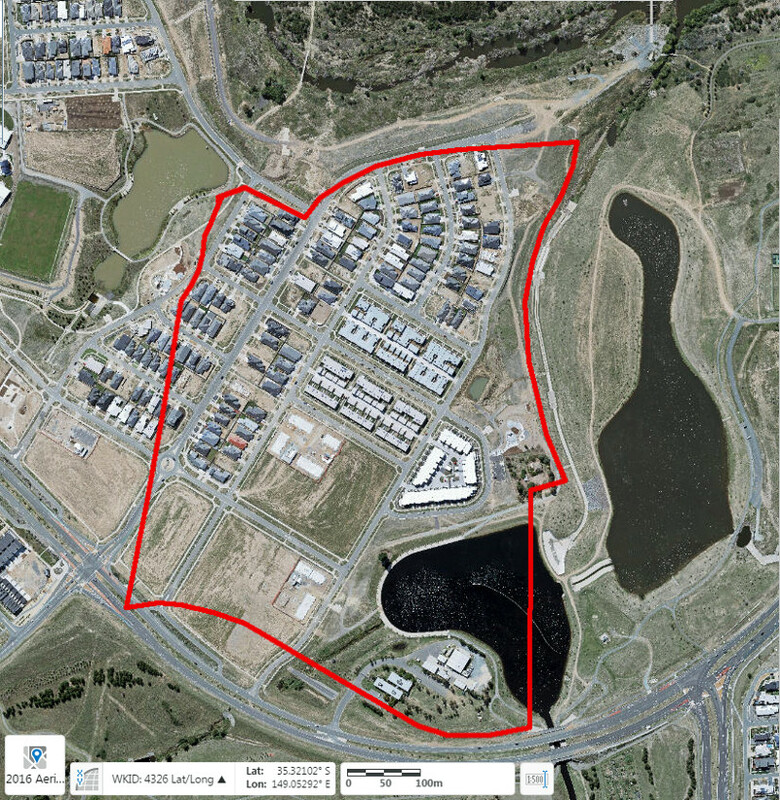 With the changes to the Tax Act reducing new investment in UAA's projects, and negotiations between the DCT and UAA stalled, the dream of Studio City Canberra soon vanished. Despite all the time and money spent on the proposal, construction never began. By February 1985, the DCT, responding to an NCDC enquiry on the proposed studio, stated "As nothing has been heard from the proponents for over 12 months the Department considers that the application has lapsed." UAA continued to provide funding towards a number of feature films throughout the 1980s, but finally deregistered in 1999. 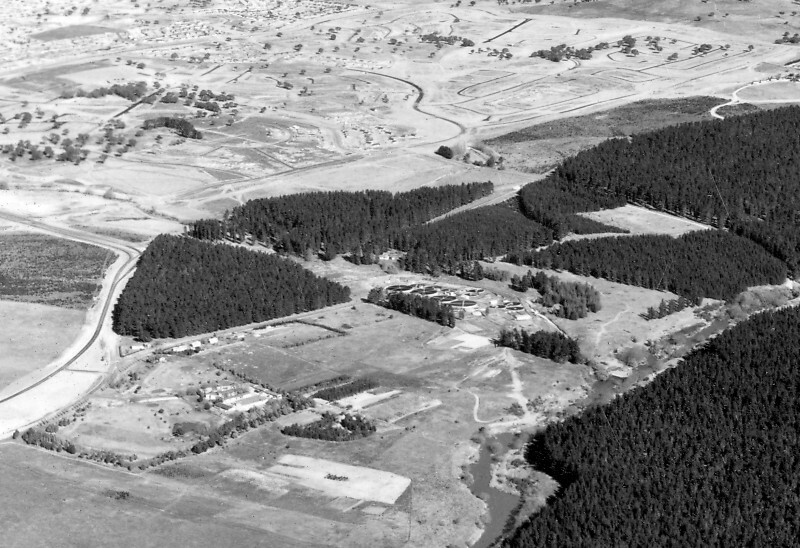 With the failure of Studio City Canberra, the site remained a pine plantation for another 25 years until its gazettal in 2010 as part of the suburb of Coombs. It is however interesting to note that one design feature of Studio City Canberra, a man-made lake, also forms part of the new suburb. While the Studio City remains a long lost dream, Canberra's potential as a filmsetting is being realised in recent productions like the movie Galore and TV series The Code and Secret City.